Such a sad ending–everyone who isn’t an original X-Man dies. The Defenders’ foe Manslaughter returns to try to join the team just when the book ends. No, that’s not the real Elf With A Gun, it’s a hologram, but writer Peter Gillis’ decision to include it in the team’s final story is a great tribute—and a reminder that the Elf subplot never really got resolved. …Which makes me sad. We didn’t need Beyonder showing up as a deus ex machina. Gillis writes him as, almost literally, “the” God, by which I mean the Christian all-knowing creator and controller, which means he can magically make Moondragon a good guy again. 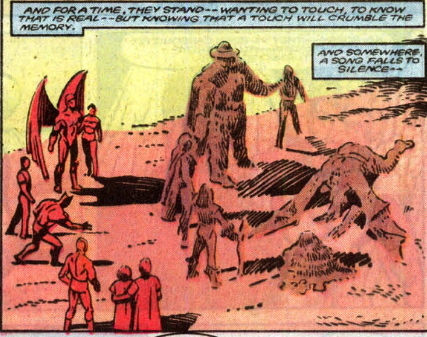 I would rather have seen the team of Defenders do the work in their final story. The good news is, once he’s gone, Moondragon immediately reverts—so the whole Beyonder sequence was entirely unnecessary. She also gives Angel his vision back, which seems odd since she’s trying to destroy the team, but makes sense when you realize that this is the final issue and, like all Marvel books, the intent is to wipe the slate clean for the next person who uses the character. And, in the end, Valkyrie, Manslaughter, Moondragon and Gargoyle die. Grade: B-. Story and art are a solid C+, add to it that it’s a final arc and it becomes a B+.